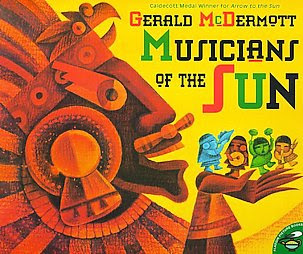 In McDermott’s retelling of a fragment of a Mexica (Aztec) “myth,” the deity Tezcatlipoca, Lord of the Night, sends Wind to bring the Musicians of the Sun to Earth, in order to bring joy and color to the world. Here, Wind is the “good guy” who uses weapons of thunder and lightning to best Sun, the “bad guy.” McDermott’s intense colors, from acrylic fabric paint, opaque inks, and oil pastels on handmade paper, are appealing to young children and their teachers. As with his other books, Musicians of the Sun has garnered rave reviews. Did you get that last one? If not, I’ll repeat: “reflecting that cruel and passionate culture.” This is precisely the problem with Musicians of the Sun and McDermott’s other children’s books. In McDermott’s world, you can take whatever you want and make it yours. And if anyone criticizes your work, as a dear friend of mine did at a “multicultural” conference at which he was speaking, well, you have the privilege of alleged artistic talent, undeserved fame and fortune, and grandiose arrogance on your side. At that particular conference (and I imagine at many others), I heard Gerald McDermott publicly voice his opinion that there is no such thing as what he disparages as “cultural copyright.” In the case of Musicians of the Sun, McDermott’s version of a Mexica creation story that he found in a French translation of a version set down by a Spanish missionary in the 16th century and several other versions in the 16th and 17th centuries, became, for him, “a metaphor for the artist’s journey.” No joke. He describes his hunting for, taking of, and manipulating a sacred creation story as a metaphor for his own personal journey. This is the kind of “retellings”—read cultural theft—of traditional stories for which McDermott is famous. Not recommended.